The great German philosopher and aesthetic theorist Theodor Wiesengrund Adorno (1903-1969) was one of the main philosophers of the first generation of the Frankfurt School of critical theory. As an accomplished musician, Adorno originally focused on the theory of culture and art. He later turned to the problem of the self-defeating dialectic of modern reason and freedom. 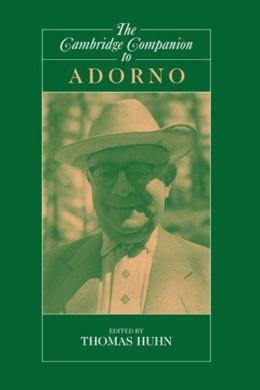 A distinguished roster of Adorno specialists explores the full range of his contributions to philosophy, history, music theory, aesthetics and sociology in this collection of essays.